It is no secret general manager Peter Chiarelli will be looking to give the Edmonton Oilers roster yet another facelift during the upcoming offseason. While a change on the back end is a forgone conclusion, the former Boston Bruins GM might have his hands tied when it comes to his forward ranks. Surprised? Well, you really should not be because if you take a look at the contract situation facing this organization for the coming year, making wholesale changes could prove to be rather difficult. In order for the Oilers to actually improve their defence prior to the start of the 2016-17 campaign, they are going to have to part with one or possibly even two of their so-called core pieces. With that mind, one can easily look at this current group of forwards and slot them into one of five groups. 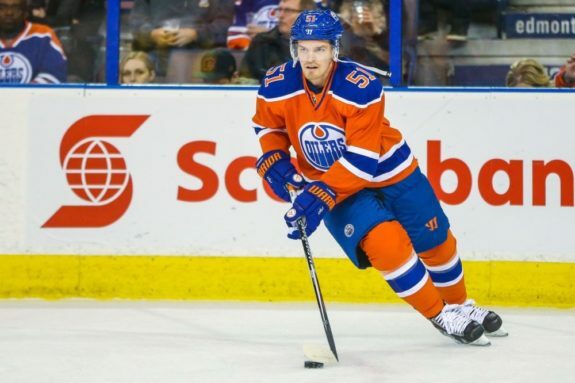 Outside of Adam Cracknell and Luke Gazdic, who should have zero chance of being on this team come next October, everyone else could still find themselves back in Orange and Blue … and that would certainly not be a good look. In actuality, this group contains far more than the three names listed but considering what might happen this summer, there is no guarantee of who will be joining them in Year 2 of the Chiarelli regime. Obviously, the kid who wears No. 97 on his back is in a class all his own and will likely take that next step towards becoming the face of the NHL during his sophomore campaign. As far as the other two go, both should play key roles for this organization in 2016-17 and for that very reason, they find themselves included on a list McDavid. The moment Edmonton acquired Maroon and the remaining two-years on his contract from the Anaheim Ducks at the Trade Deadline, it was a forgone conclusion he would be part of the equation for the foreseeable future. The same holds true for Pouliot, who still has three years remaining on the five-year free agent pact he signed in the summer of 2014. While both are complementary players, they are pieces this team desperately requires which only further solidifies their inclusion in this group. One of these players will be in a different locale come next season and, in my mind, the probability is quite high that two will no longer be part of the organization past this summer —possibly even three. As far as who stays and who goes is anyone’s guess at this time. but whoever remains will automatically go into the previous group. Add three of these names to the trio of McDavid, Pouliot and Maroon and you likely have the makings of Todd McLellan’s top two lines for next year’s edition of the Oilers. This is where things will get interesting for Chiarelli and the rest of the management team. Outside of Hendricks, who continues to be a useful bottom-six piece and a major player on the leadership front for this group, the rest are guys the Oilers would probably love to upgrade prior to the start of next year. One would think they will manage to find a taker for Lander and his $1 million cap hit but won’t see much of return on their investment. However, pulling off such a feat could prove to be far more challenging when it comes to other two. I'll give Chiarelli some real credit if he can dump Korpikoski or Letestu. Now that'll take some doing. Could the club retain salary in a potential deal to move either Korpikoski or Letestu? Possibly, but considering they will already be paying Andrew Ference to not play for them and will finally be getting out from ugly deals (hello Nikita Nikitin and Ben Scrivens), my guess is owner Daryl Katz has grown tired of throwing money at guys to clean up messes from a previous regime. With that said, this one is on the current GM who could have easily avoided this scenario had he simply kept Boyd Gordon around for the final year of his deal instead of making change for the sake of making it. For a guy who started the season in the AHL and nothing more than an afterthought in the mind of this coaching staff, Pakarinen has made enough of an impression that he has occasionally found himself being used in a top-six role. While he has no business being slotted in said role with any sort of regularity, the 24-year old has been a pleasant surprise and turned himself into a useful piece for his head coach and a rather intriguing option moving forward. While Kassian has been inconsistent since coming over from the Montreal Canadiens in exchange for Scrivens, his skill set and flexibility has seen him used on all four lines and in a variety of different roles. Yes, the inconsistencies are a concern but considering the situation the former 13th overall pick had been dealing with prior to his arrival and couple that with his lack of playing time, they should have been expected. Much like Maroon, the 25-year old’s willingness to engage physically but still be able to contribute at the offensive end is something that can’t be ignored. Without question, this trio of youngsters is who this organization is counting on to develop into useful NHL players. Unfortunately, as Oilogosphere legend Dennis King correctly pointed out via Twitter, there is a good chance none of them become those guys. My guess is we could see Khaira earn himself a spot out of camp but don’t be surprised to see Chiarelli add any of the three into a trade to help upgrade his defence or bring in another big bodied NHL veteran to help balance out the current roster.